With the weather starting to warm up, and being in Italy, we decided it’s time to enjoy the Dolce Vita – which for us includes food and wine. After this hard work we joined our German boat neighbor (but resident of Italy) for apperitivos at the marina bar. The barkeep explained to us that the oldest cocktail in Italy is called the “Americano.” Due, per favore! It is delicious. Not quite as old, but equally as delicious is the Negroni. Then, finally it was time to meet up with our friend Matteo. 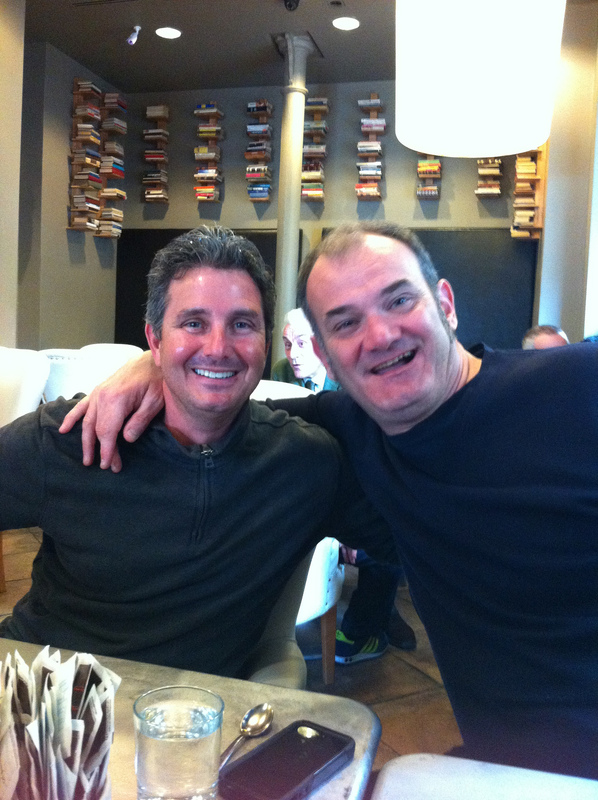 Darold met Matteo Fontana, a native of Milan, when they were both traveling through New Zealand in 1993. They have kept in touch since then, both visiting each other in their respective countries a number of times, including Matteo attending our wedding in 1999. 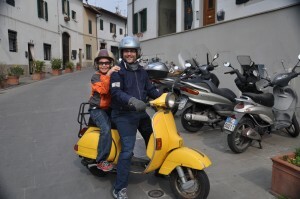 Now, Matteo lives with his partner, Titti, in Florence with their 2-year-old daughter, Emma. 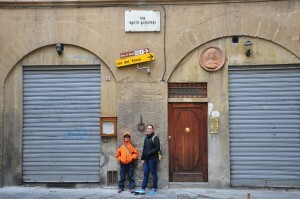 Matteo’s house is on the outskirts of Florence and is over 400 years old. The interior is modern but with hints of antiquity, such as the ancient wooden beams and bricks in the ceiling and stone archways over the doors. 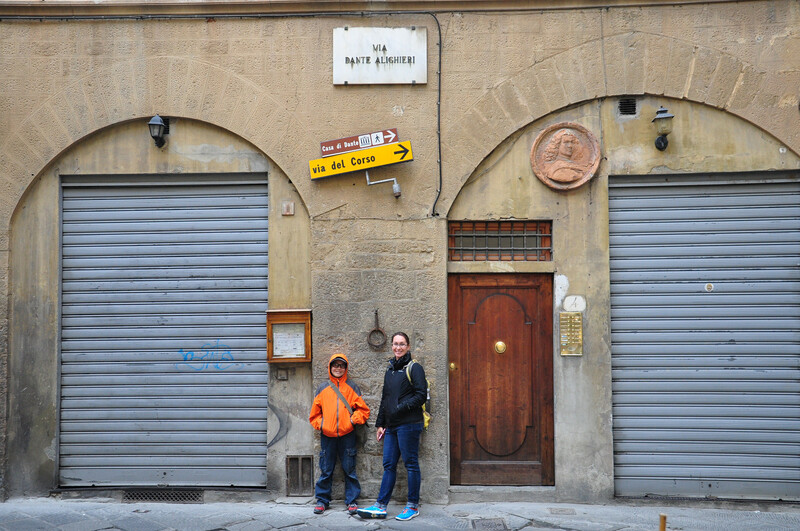 Their house is a 15-minute train ride into the city center. Our first night there we had a delicious baked pasta made by Matteo, washed down with wine. Sunday, March 22: Dante, Darold and I go into Florence to visit the Ponte Vecchio, a replica of the house of Dante Aligheri, the Palazzo Pitti museum and have long lunch in a beautiful piazza. Do you know you can get an entire liter of good Italian wine in a carafe for something like $5.00? No, really – it is GOOD wine. Tuesday, March 24: We find ourselves in a rented car (a brand new Fiat 500) touring the Chianti countryside to “taste Toscana” including the views, the fresh air, the windy roads, the food and yes, yes of course the vino. Are you noticing a pattern here? I know some of you might think drivers in Italy are crazy, but Darold feels right at home navigating the roads. He loves the “don’t mind the rules, just don’t hit anything” approach to driving. 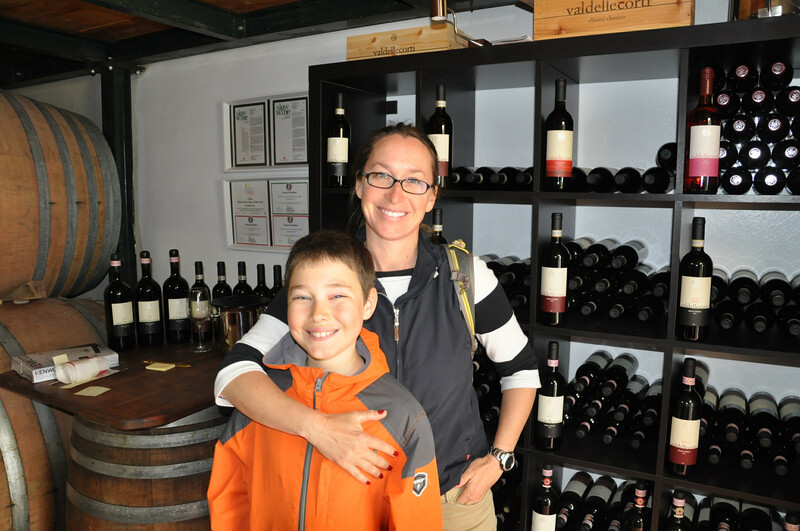 We drive to the small, family-owned winery of Val Delle Corti, near Radda in Chianti. 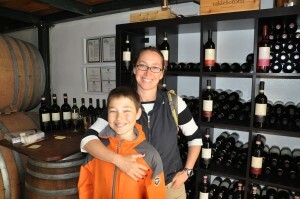 After tasting all their vintages we buy six bottles of their award-winning vino. Purchasing wine serves a practical purpose on a boat. 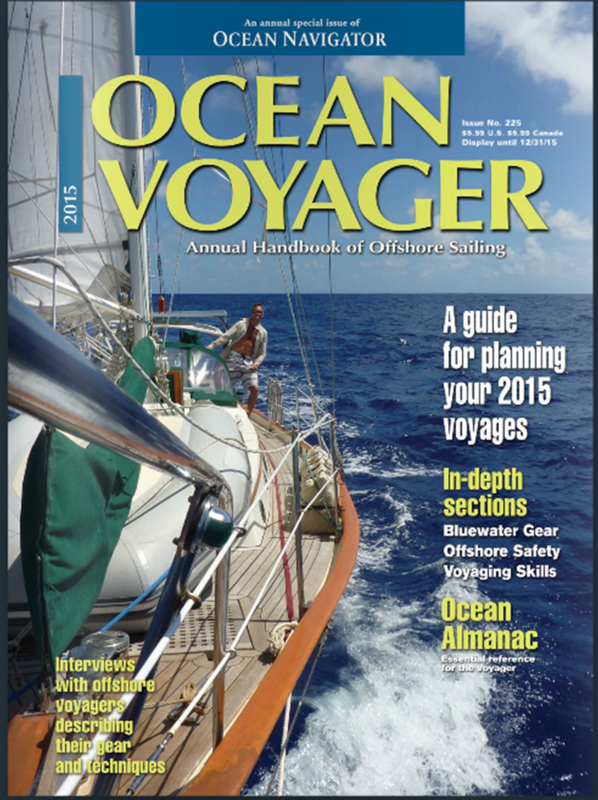 You put it in the bilge (bottom of the boat), which makes the boat more stable. This was excuse, at least. 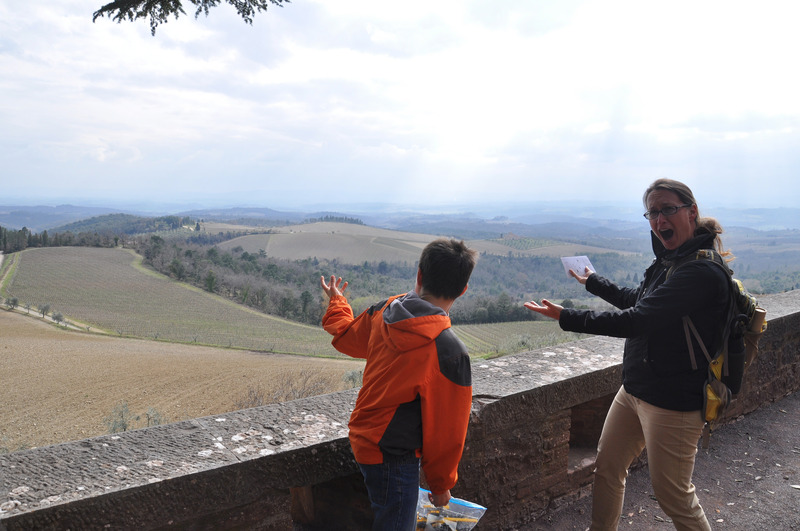 We followed that with a tour of Castello di Brolio, a castle atop the oldest winery in Italy (and second oldest in the world). Castello di Brolio is the ancestral estate of the aristocratic Ricasoli family, dating from the 11th centrury and is currently home to the 32nd Baron Ricasoli. Baron Bettino Ricasoli (1809-1880) is the most famous Baron in the family. He helped promote the unification of Italy, was the second prime minister of the Republic of Italy and a true polymath (scientist, farmer, wine maker, statesman and businessman.) His greatest claim to fame was inventing the formula for Chianti Classico (80% Sanviovese grapes). The tour of the castle came with a free wine tasting, so of course we had to do that too. We buy more wine, errr I mean ballast. 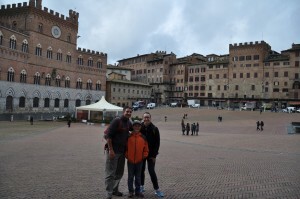 Wednesday, March 25: We enjoy Siena’s amazingly intact medieval city center. 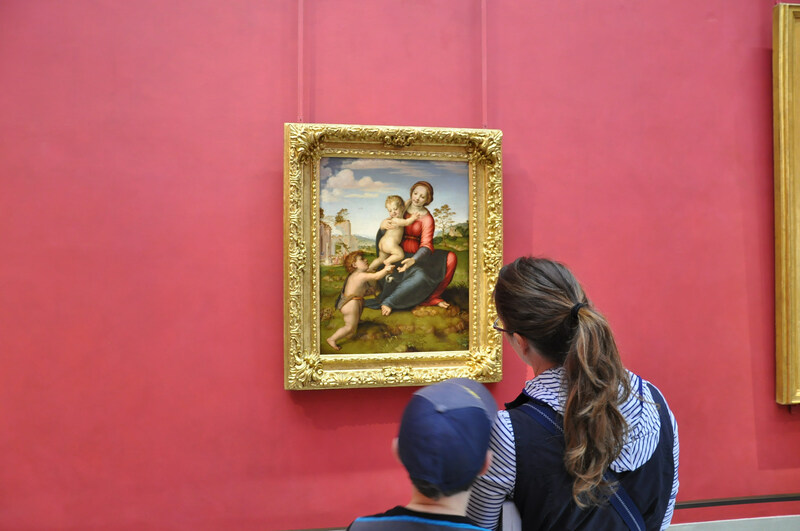 We tour the beautiful Duomo and art museum, and later Darold and I enjoy a nice “date night” out with more (you guessed it) – vino. Did you know that most Italian bars serve an array of appetizers during their apperitivo time (happy hour)? Or, they’ll provide you with a whole plateful of food along with your drink? It’s very civilized. Friday, March 27: We take the high speed train to Milan. First stop: Luini, Milan’s famous “Italian fast food” restaurant, which serves mozerella and fresh tomato sauce enveloped in friend doughy goodness, called “panzerotti”. There is always a line snaking out from Luini’s, but it moves fast. Unfortunately they don’t serve wine. This is Darold’s favorite place to eat in Milan, and loves to take the panzerotti and enjoy them on the steps of the Duomo. Ahhh, Italia…la Dolce Vita. Afterwards, we are ready to climb the stairs to the top of the Duomo. We’ve been in the Duomo at least 4 times, but this was our first time on the roof. It was a beautiful, clear, spring day and you could see the snow on the Alps. (Bellissima!) 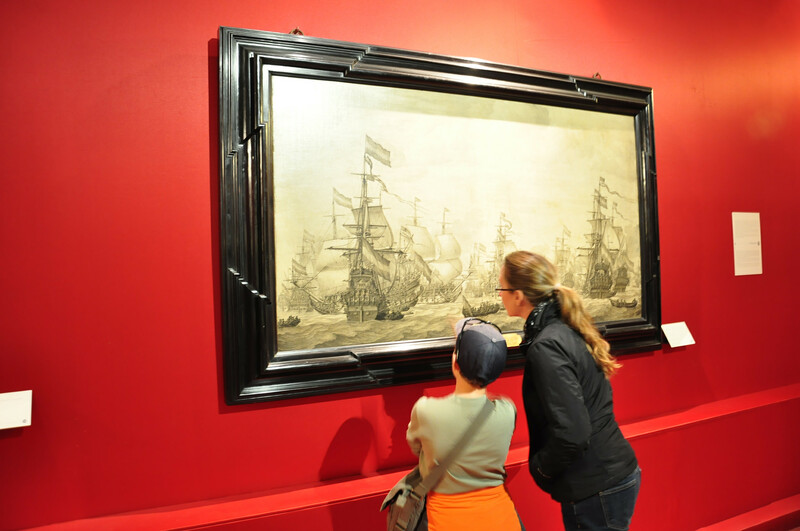 We followed that with a walking tour of the city center, then visited the Pinocoteca Brera art museum. Dante stayed in the hotel (to work on his Ancient Rome report) while we had another “date night” at an Italian wine bar, where we are the only tourists (nicely enough.) 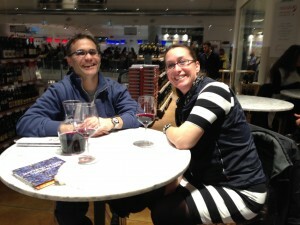 We saw it as our duty to try wines from different regions of Italy. White wine from Sicily and red wine from Piemonte pair really well with prosciutto, crudité, bread and cheese. Delizioso! 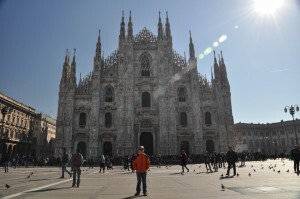 Saturday, March 28: More of Milan. We go to see the inside of the Duomo, which is absolutely beautiful. Then we go to the Art and Science Museum to see the Leonardo da Vinci exhibit. Matteo calls us and tells us he is in Milan early so we meet him at Eataly, which is a food megastore that combines elements of a bustling European outdoor market, a Whole-Foods-style grocery store, a wine and beer shop and a high-end food court and cooking school. Simply put: it’s a foodie Heaven on Earth. We arrive early. They are serving cold red wine from Piemonte out of a barrel and it’s cheaper if you buy it by the liter. Guess what we did? 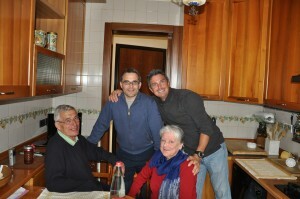 Sunday, March 29: We meet up with Darold’s Italian roommate from when he lived in Sydney, Massimo Conti, for coffee. 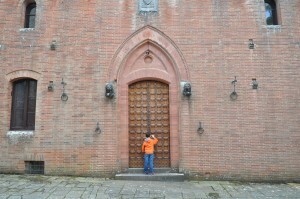 Then we hightail it over to the north of Milan to meet up with Matteo and his parents for lunch. We have met his parents a number of times over the years and are extremely fond of them. They treat us to a beautiful pasta lunch in a local restaurant. I know what you’re thinking…more red wine! But you’d be wrong. I had pasta with fish so we had white wine instead. Tuesday, March 31: We go back into Florence to tour the Uffizi (wow. just wow. ), the Leonardo da Vinci Museum and the Duomo. Matteo is in the city center for work so we meet him for gelato. We end the day at Matteo’s house for The Last Supper – freshly made torteloni di patate. 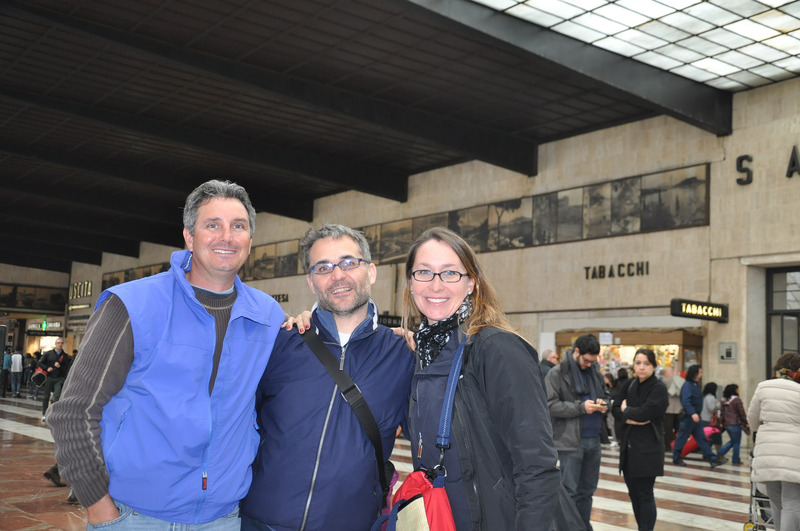 Saturday, April 4: We take the train to Lucca, a beautiful, walled medieval city and meet up with Matteo, Titti and Emma for the last time. We have lunch (with wine) at a quaint osteria. Osterias were traditionally taverns focused on wine. However, these days it’s closer to a trattoria, or a wine bar, offering a handful of dishes to eat. Sunday, April 5: Easter on the boat! Italians (at least in the north) traditionally eat a sweet cake called “columba” and kids get a large hollow chocolate egg to eat. They also have a hunt for smaller, filled chocolate eggs. Unfortunately it’s windy and rainy at the marina. Oh well, we can now open a bottle of the wine we bought at Val Delle Corti. In the spirit of safety, we will need to soon buy more ballast. 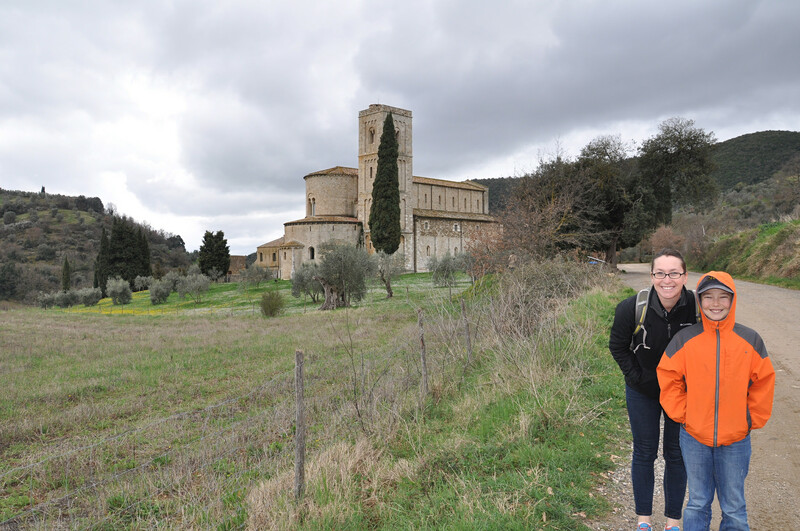 Monday, April 6: We shove off for the islands off the coast of Tuscany, starting with Isola d’Elba. After a 6 hour sail, we drop anchor at sunset in Portoferraio. For four days we do little else but rest and enjoy the views. Unlike Napoleon (who was exiled here in 1814), we are in no rush to flee this island. We take one excursion into Portoferraio to see his house. Saturday, April 11: We sail five hours in 15 knots to another part of the island – a beautiful anchorage near the town of Port Azzuro. There is another boat anchored near us so Darold and Dante invite them over for drinks. We spend the afternoon drinking wine with this terrific Italian couple from Florence then we go over to their boat later in the evening for dinner. The Italian couple could easily be transplanted into Silicon Valley; they are architects by trade but have started a website for people (around the globe) to check on the “eco sustainability” of companies (www.greenwatchers.com). Total bottles of wine consumed: three. Fortunately, the island of Elba is known for its wine so the next day we go into town for lunch (un litro di vino della casa, per favore!) and buy more bottles. Monday, April 13 – No wind, so we motor 9 hours to the beautiful little fishing port of Porto Ercole. We anchor near a tiny island filled with seagulls and our view consists of a medieval fort. The weather is settled and it’s sunny. We decide to stay an extra day and rest up for what we know will be a very busy stay in Rome. Go to our Flickr site to see the rest of the photos! Where in the world are we now? Click “Current Location” below to find out.